With two decades of experience in nuclear hormone receptor drug discovery, our RORγt drugs are “structurally engineered” to provide high potency and specificity in the target tissue and a high safety margin in patients. 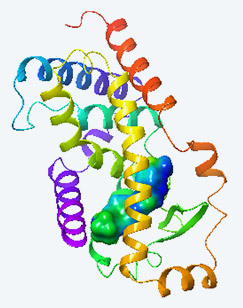 Small-molecule inhibition of RORγt has been shown to reduce production of the inflammatory cytokine IL-17, which plays a key role in autoimmune disorders. Inhibitors of RORγt are being developed for the treatment of IL-17 mediated autoimmune diseases, such as psoriasis and associated co-morbidities. RORγt inhibitors have therapeutic opportunities beyond psoriasis, such as psoriatic arthritis, rheumatoid arthritis, lupus, inflammatory bowel disease and multiple sclerosis. Small-molecule inhibitors of RORγt are also called RORγt “inverse agonists”. Data from a recent clinical trial in mild-to-moderate psoriasis patients has validated RORγt as a target for psoriasis therapy.